I want to share a neat infographic that was published by the World Intellectual Property Organization (WIPO). 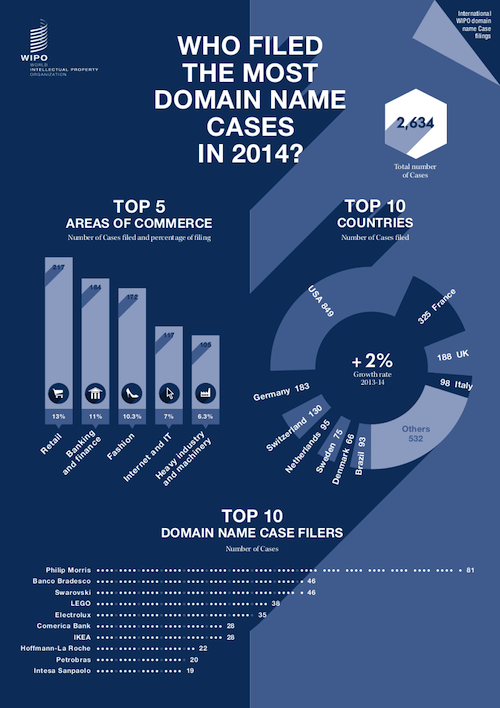 The infographic illustrates a few facts about the year in UDRP filings for 2014, including the companies that filed the most UDRPs, the countries that had the most UDRP filings, and the top 5 areas of commerce that had UDRP filings. One aspect of the UDRP filing report I would be most interested in learning about is the number of filings by extension. I am quite sure .com had the most UDRP filings, and I would be curious to know what other extensions had a significant number of UDRP filings. It would also be interesting to note how these numbers change over time. You can read the full analysis of the report on the WIPO website. I shared the infographic below. Good artice on UDRP’s Elliot.